Now that I'm working on my 54th podcast, I'll admit, I love podcasting almost as much as writing. Starting back in 2009 I've podcasted many of my lectures, readings, and other events for my books, plus I created and continue to host two podcast series, "Marfa Mondays" and "Conversations with Other Writers." It remains just as awesome to me now as it was with my first podcast that, whether rich or struggling, famous or new, we writers can project our voices instantly all over the world, while making them available to listeners at any time. But first, what is a podcast? I often say it's an online radio show. But the truth is, it's a much wilder bouquet of possibilities. 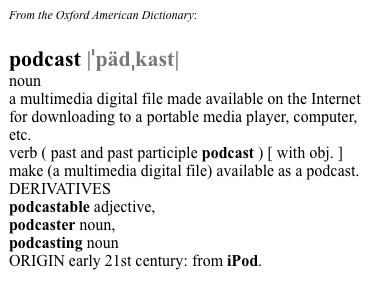 A "podcast" is just an online audio (and, less commonly, video) file. It could be of a deeply probing interview; of a bunch of kids singing "Kumbaya"; or of say, you reading your epic poem about belly dancing in the grocery store. It could be a single fileyour reading at your local bookstore on March 17, 2015, or, say, a radio show-style series of interviews with fellow horror novelists, one posted each Saturday upon the toll of midnight. There may be an eye-crossing number of ways to categorize these things, but if you're writer thinking about getting started with podcasting, I would suggest that you first clearly identify the level of commitment you are willing to make to your listeners who lets hopeare going to be eager for your next podcast. This would be a single, stand-alone podcast. Such is my first, which is simply a recording I made of my lecture I gave at the Library of Congress back in 2009 about the research behind my novel, The Last Prince of the Mexican Empire. Listen in to my lecture for the Library of Congress. I call my podcast series "Conversations with Other Writers" an "occasional series" because, as I state on the webpage, I post these "whenever the literary spirits move me and the planets align." Right now, that's about once a year... maybe. By the way, I just posted the eighth podcast in this series, a conversation with historian M.M. McAllen about a mind-blogglingly transnational period in Mexican history. Listen in to this Conversation with M.M. McAllen. This would be my "Marfa Mondays Podcasting Project," 24 podcasts to run from January 2012  December 2013, apropos of my book in-progress on Far West Texas. Not all but most of these are of interviews, and although I have posted 20 so far, my self-imposed deadline of December 2013 did not hold, alas. For reasons too complex to go into here, in the middle of this project, I went and wrote a biography. And that's OK. I may be slow, but with only four more podcasts to go, I'll get there soon enough! Listen in to the "Marfa Mondays" podcasts. This would involve high production values, a regular, strictly respected, and ongoing schedule, and surely necessitate and perhaps even command fees from listeners by way of "memberships." Into this last straight jacket of a category I quake to venture, for I really do love writing more than I love podcasting.